Bioeffect is an Icelandic skincare brand representing the future of scientific skincare formulated with cutting-edge technology to renew and replenish the skin. A study in January 2012 shows that 96% of women using Bioeffect skin care products noticed visible results within weeks. Years of biotechnical research have been put into the development of Bioeffect skin care products and the ingredients utilized in every product is effective, pure, and safe. Bioeffect skincare is based on 10 years of scientific biotechnology to deliver direct anti-aging benefits to the skin. The active ingredient, EGF, is grown in volcanic pumice produced in barley plants and is carefully watered with spring water originating from Iceland. Bioeffect anti-aging skin care has been proven to be effective in independent, double-blind, placebo-controlled clinical studies. Bioeffect products are especially renowned for the radiant glow induced in the skin. Not only will it help you achieve an even-toned complexion, but you will also notice a substantial difference in the luminosity and dewy allure of your skin, radiating well-being and youthful vitality. Bioeffect products are the result of decades of research in anti-aging technologies and research in molecular biology, grounded in Nobel Prize-winning insights and discoveries. These state of the art skin care products are formulated with green biotechnology that harnesses the power of your skin’s own system of renewal so that the skin can naturally heal and repair itself from damage. They are truly groundbreaking products that are a good representation of the next generation in skin care advances. Bioeffect skincare products are formulated to contain ingredients with both anti-aging treatments as well as ingredients that correct current aging signs. They will also add luminosity and vitality to induce radiant skin by visibly enhancing dull skin, providing immediate and long-lasting results. The Bioeffect EGF Serum has a reputation for being the latest skin care miracle product due to its ability to deliver rapid, long-lasting results that are noticeable and dramatic. It is specially formulated with Epidermal Growth Factor to activate the natural cell regeneration process in your skin, which fights signs of aging while boosting the overall health of your skin. This product is lightweight and moisturizing, perfect for all skin types, and soaks in quickly to eliminate dry spots and dark circles for an even-toned, radiant complexion. The Bioeffect EGF Day Serum is specifically formulated for use during the day with its light, silky texture that absorbs instantly and applies smoothly. The Bioeffect EGF Day Serum is an advanced skin care product that delivers several anti-aging benefits for daytime usage. Continue to fight aging signs such as fine lines and wrinkles throughout the day as the product works to deeply hydrate the skin to unveil its natural glow. It works to restore, renew, and revive your skin’s moisture balance and dries down to a smooth finish, making it perfect as a base for seamless makeup application. The Bioeffect 30 Day Treatment is an intensive anti-aging skin booster that will surpass your expectations in terms of what skincare has the ability to do. These intensive treatments will supply the skin with 3 cellular activators normally found in high concentrations in youthful skin, which will deliver dramatic, noticeable results that turn back the clock and reveal qualities of firmer, radiant, and rejuvenated skin. 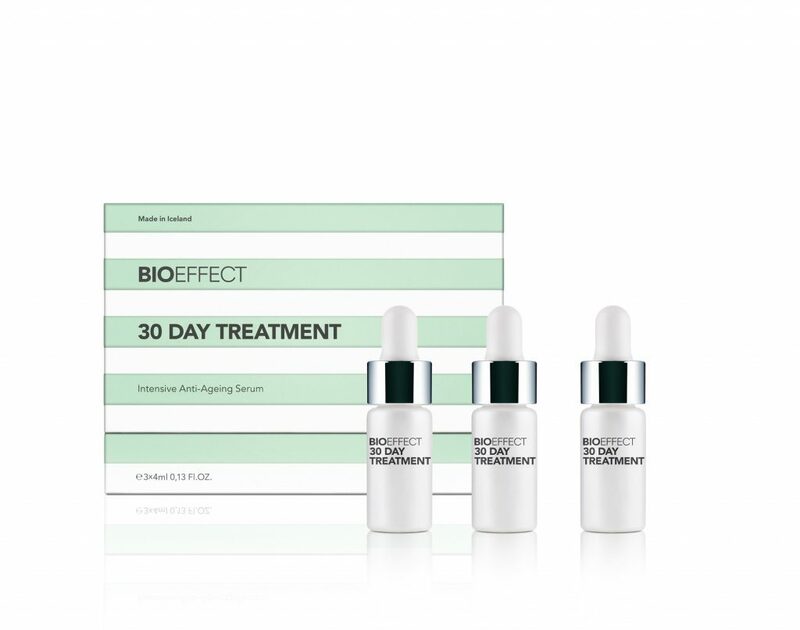 The Bioeffect 30 Day Treatment is the first and only set of skin care products that contain 3 distinctive types of cellular activators found naturally in human skin, except re-created and re-formulated with plant-based ingredients. The Bioeffect Skin Harmony Set was made to keep the skin balanced and harmonious. It combines nutrients and moisture with excellent ingredients to repair and revive the skin, all while cleaning the skin gently yet effectively. It includes the Bioeffect EGF Day Serum, an advanced anti-aging serum that is specially formulated for use during the day. It fights several signs of aging and delivers deep hydration to the skin. It also dries down to a silky smooth finish to make the perfect base for the application of makeup. The best-selling and award-winning Bioeffect EGF Serum works to minimize the appearance of fine lines and wrinkles to restore your skin’s youthful radiance. It also delivers deep hydration and revives your skin’s complexion. Lastly, the Bioeffect Micellar Cleansing Water is a fragrance-free micellar water used to remove makeup, dirt, and debris on the face and eyes. It quickly and effectively removes impurities without leaving any trace behind. The Bioeffect Skin Rejuvenation Set is aimed at restoring the youthful radiance in your complexion in as little as 30 days. It includes the Bioeffect 30 Day Treatment, a triple-action treatment that fights the signs of aging with 3 growth factors: EGF, IL-1a, and KGF, which occur naturally in human skin. The combination of ingredients will maximize tone, hydration, and radiance while fighting wrinkles, redness, and pore size. Included is the Bioeffect OSA Water Mist, an ultra-light facial mist that will refresh, rehydrate, and rebalance the skin throughout the day. Leaving behind a natural matte finish, it contains orthosilicic acid to stimulate the body’s natural production of collagen to strengthen the skin. The Bioeffect Skin Innovation Set represents true scientific innovation. It contains the fragrance-free Bioeffect Micellar Cleansing Water that will gently lift and remove makeup and other impurities on the skin without leaving residue behind. It is followed by the Bioeffect EGF Serum to deliver anti-aging benefits to the skin by fighting dull skin and fine lines and wrinkles by reviving the complexion while also delivering hydration. This set also contains the Bioeffect EGF Day Serum, an advanced anti-aging serum specifically formulated for use during the day. It fights multiple signs of aging and deeply hydrates the skin all while drying down to a silky smooth base to prep the skin for the application of makeup.